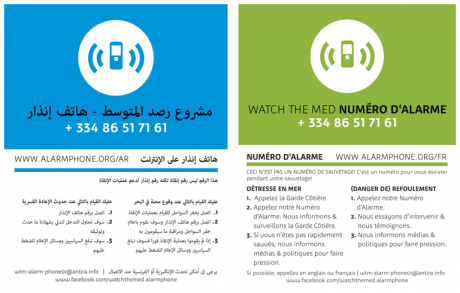 Activists from the network WatchTheMed Alarm Phone created a ‘hotline’ for people in distress at sea in 2014 and have since engaged with tens of thousands in emergency situations in the Mediterranean. Advocating freedom of movement for all, the activists understand their maritime intervention as a challenge to Europe’s exclusionary border regime and its production of Mediterranean ‘death zones’. In solidarity with unruly human mobilities, the phone-line seeks to foster new modalities of collective political struggle in unlikely spaces. A boat leaves the Turkish shore, in deep darkness. It is on Saturday June 11, 2016, a few hours past midnight, that fifty-three people, including fourteen children, risk their lives at sea. They hope to reach the Greek island of Chios and, thereby, Europe. The fifty-three have come a long way. They fled from Syria, Eritrea, Iraq and elsewhere, only to find that Europe does not want them, that Turkey is supposed to be the final stage of their journey, or even the place of their forcible return, back to war, fear, poverty. Land borders to Greece have long been fenced off, heavily patrolled by Greek-European and Turkish forces. More recently, they have begun to close off the sea too. Not with barbed wire, watch towers, and sniffer dogs, but through the interplay of multiple regimes of authority and (maritime) mobility control. Following the infamous EU-Turkey deal from March this year, the Aegean Sea has ceased to be the liquid gateway to Europe. Increased collaborations between Turkish and Greek border authorities, themselves suspiciously monitored by patrol boats sent by EU border agency Frontex and NATO, seek to create a dystopian maritime panopticon to expose unauthorised movements. 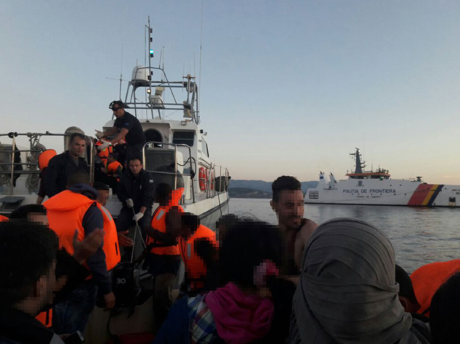 Forced back by police and military, thousands are hindered from embarking on sea journeys in the first place, and many of those who make it to the Turkish shore face rapid capture and forced return. Experiences of failed sea-crossings and the awareness that thousands remain stuck in Greece after successful crossings circulate among migrant communities, and many now hesitate to invest considerable sums of money in what would quite possibly turn into several costly and dangerous attempts to overcome the sea, possibly only to end up in Europe’s hotspot-detention-deportation centres on the Greek islands. It is in this context of maritime surveillance, militaristic mobility governance, and trans- and supra-nationally coordinated deterrence efforts that every refugee boat leaving Turkish shores is a rebellion. It is in this context... that every refugee boat leaving Turkish shores is a rebellion. With waves and currents calm enough even for a small rubber dinghy, the fifty-three travellers move swiftly through the night. At 3.59am, one of them reaches out to the WatchTheMed Alarm Phone, an activist hotline seeking to support those who enter situations of distress at sea. While not facing a situation of immanent distress, it seems important for them to know that someone else is following their case, that their fate is not completely unknown. GPS positions sent to the solidarity activists show them still in the territorial waters of Turkey. Here they face interception if discovered and caught by Turkish authorities. They need to move on, across the historically disputed maritime borderline and into Greek waters, from where they can launch a distress call and be transferred by Greek coastguards, or move on and dare to land on Chios Island by themselves. But the refugee boat is not alone. Discovered by Turkish coastguards, the travellers are being chased. After half an hour, they write to the Alarm Phone, relieved: “we have escaped the Turkish coastguard”. Once within Greek territorial waters, they encounter the Greek coastguard and board what they believe to be a rescue vessel. Pictures taken on their smartphones and passed on to the Alarm Phone document their transfer, as well as the presence of two other vessels near-by, two Frontex vessels. These dramatic scenes of a so-called ‘push-back’ practice, the illegal collective expulsion of ‘aliens’ from a country’s territory, have played out innumerable times in the Aegean Sea before. Many of the individuals and groups affected experienced not ‘merely’ forcible returns back to Turkey, but reported brutal and cynical attacks carried out by often masked and armed special units of the Greek coastguards who at times physically abused travellers, removed petrol and engines, and even punctured refugee boats, leaving them behind in darkness and life-threatening distress. Newly released and unredacted Frontex incident reports, covering the period between May 2014 and December 2015, now show that the European border agency has long been aware of the employment of firearms by Greek coastguards in attempts to stop refugee vessels, causing injury and even death to travellers on board. Since the EU-Turkey deal, novel forms of collusion between Greek, Turkish, EU/Frontex and NATO authorities seem to have emerged. Whereas the Turkish coastguards confronted their Greek counterparts as recently as November 2015 with released footage showing Greek authorities seemingly deliberately trying to sink a refugee boat, asking them “to refrain from such acts”, their relationship seems to have improved, post-deal. With the presence of Frontex and NATO vessels in the Aegean, functioning as watchdogs of an agreement outsourcing EU responsibility to Turkey, Turkish coastguards seem much more inclined than before to intercept refugee boats in their waters and to return and detain the unauthorised travellers. The Alarm Phone has previously reported on interceptions that were conducted by Turkish coastguards in the presence of NATO. This push-back case from June 2016 highlights not only the now well-coordinated human rights violations at sea, but demonstrates the EU’s direct implication, in the form of Frontex’s presence. This is a rare case - the EU border agency is notoriously adept at distancing itself from full-on criticism for its involvement in grave human rights violations. In response to the allegations, Frontex merely suggested that they were still in the process of collecting information relating to the incident and thus could not further comment. Fortunately, though not so much for Frontex, the incident has been thoroughly documented by the refugees themselves and Alarm Phone activists. 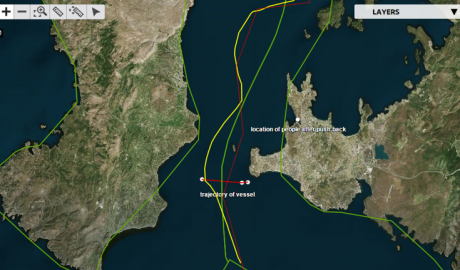 Images and GPS positions passed on, WhatsApp exchanges between the travellers and activists, as well as direct testimonies of the survivors collected by the Alarm Phone after the group was released from prison, allow a detailed reconstruction of the trajectory of the vessel: its journey through Turkish waters and arrival in Greek territory, the transfer of the group first onto the Greek and then the Turkish vessel, Frontex’s presence at the scene, and, later, their disembarkation at the harbour of Cesme/Turkey. Map showing the trajectory of the pushed-back refugee vessel, 11th of June 2016; Source: WatchTheMed Alarm Phone 2016. Click to enlarge. Initiated by a coalition of freedom of movement, human rights, and migrant activist groups, including WatchTheMed, Boats4People, Welcome to Europe, Afrique Europe Interact, Borderline-Europe, No Borders Morocco, FFM and Voix des Migrants, the Alarm Phone responds to violent ‘border protection’ practices and the unabated mass dying in maritime spaces around Europe, and offers travellers alternative ways to make their distress heard, in real-time. They resist making a distinction between subjects constructed as ‘economic migrants’ and those as ‘refugees’, and support anyone travelling for whatever reason. When one climbs on board overcrowded, unseaworthy vessels, there always is a good reason. Inspired by individuals such as the Eritrean Priest Father Mussie Zerai, who already for many years has responded to distress calls from the sea on his private phone, the activists built a transnational network with the aim of making the always-already precarious sea journeys less dangerous, and, in the long run, unnecessary. Source: WatchTheMed Alarm Phone 2016. Click to enlarge. Situated within and beyond Europe, in more than twelve countries and on three continents, currently more than 130 activists operate the phone-line 24 hours a day, able to support maritime movements and ‘to control border controllers’ in the central and western Mediterranean as well as the Aegean Sea. Due to the very different conditions in these maritime spaces, specific handbooks with step-by-step emergency plans and instructions had to be written, based on years of experience in migration and noborder struggles as well as local and region-specific knowledge. In addition to meteorological and geographical conditions, the organisation and modes of irregularised travelling differ considerably in the Mediterranean Sea. Precarious sea migration is an explicitly politically produced problem, part and parcel of an increasingly violent EU border regime. The build and size of vessels vary. Many have (often malfunctioning) engines: some carry only paddles. In all regions, groups of travellers are diverse and languages spoken on board range from French, Arabic, Urdu, and Farsi to English, Tigrinya, and others. Precarious travellers in the Aegean Sea often carry smartphones, which makes tracing them significantly easier than finding the whereabouts of those leaving from Moroccan shores, who usually only carry regular mobile phones. But, at least, they often have mobile phone reception, not available to the same extent in the central Mediterranean Sea. Then again, groups leaving from Libya often keep a satellite phone on their vessel which allows most of them to quickly pass on GPS coordinates and which can even be charged with credit, often by activists from afar. In the complex endeavour to write situation-specific emergency handbooks and to design ‘Safety at Sea’ flyers, to be distributed amongst communities of future border crossers, crucial insights were also offered by members of the Alarm Phone, who had once themselves crossed the sea. Ali, for example, had met Alarm Phone activists during refugee protests and hunger-strikes in front of the UNHCR in Tunisia. Moreover, in 2015 in particular, novel ties have formed between Alarm Phone activists and (other refugee) activists and networks, such as those from Syria, who decided, often after their own survival, to support sea-migration and who began to organise and communicate through novel communication technologies (for more details, see Stierl 2016). Besides its diverse composition, what distinguishes the Alarm Phone project from many of the civilian and humanitarian actors currently roaming the Mediterranean Sea with whom the activists routinely collaborate in situations of distress, is its evaluation of the ‘Mediterranean migration crisis’ (see here). For the activists, rather than a momentary emergency, precarious sea migration is an explicitly politically produced problem, part and parcel of an increasingly violent EU border regime. In response to the EU’s military reaction to the largest shipwreck of 2015, with more than 800 lost lives, which was packaged in humanitarian rhetoric, the activists wrote: “The history of the last 20 years in the Mediterranean shows that stepping up the militarization of migration routes is only cause to more death. Each and every time a route into Europe has been blocked by new surveillance technologies and increasing policing, migrants have not stopped arriving. They have simply been forced to take longer and more dangerous routes. […] Smuggling networks would be history in no time if those who now die at sea could instead reach Europe legally. The visa regime that prevents them from doing so was introduced only 25 years ago”. "Smuggling networks would be history in no time if those who now die at sea could instead reach Europe legally." Last year witnessed a record number of deaths in the Mediterranean, with more than 3,700 known fatalities. Yet the first half of 2016 alone has already seen about 3,000 lives lost at sea. For the activists, these figures are not an ‘unfortunate anomaly’ but the logical consequence of a bordered world and perpetuated forms of global injustice that have long turned many borderzones, especially those between the ‘Global South’ and ‘Global North’, into death zones and mass graves. These deaths are the result not of a quasi-natural phenomenon but of the interplay between various socio-political forces and technologies which make up contemporary border regimes, underpinned by the desire to deter certain individuals, groups, and populations deemed threatening, unwanted, and disposable. Exposing many people on the planet to a perpetual state of irregularity once they leave their ‘countries of origin’, through instruments such as the global visa regime, carrier sanctions, and various forms of externalised border enforcement, the political community of the EU increasingly resembles “a gated community in which the biopolitical control and management of immigration is, to a large extent, the product of fear” (van Houtum 2010). Booming economies of border control, created by Europe within and far beyond its territories, produce not only ever-more dangerous migration routes, but also an inflation in ‘cross-border services’ which ultimately provoke repeated European military interventions – not realising that Europe is at war with itself. It is in the face of what appears at times as an overwhelming control apparatus that irregularised border transgressions need to be understood not as mere acts of desperation that require temporary humanitarian relief, but also as instances of political struggle, as rebellions against global apartheid-like regimes of population control. In times in which both the right to move and the right to stay are increasingly eroded for a good part of the world’s population, the Alarm Phone’s support of transborder movements is not simply framed as a compassion-based intervention but embedded in a critique of global injustice. For the activists, the freedom of movement - not something utopian but something that unauthorised travellers enact a million-fold through their border transgressions - is expressed in practices that stubbornly challenge dystopian realisations of a hypermobile world for the privileged few and the accelerated borderisation of the planet for the exploitable many. If thought of in this way, dichotomies between ‘refugees’ and ‘humanitarians’, ‘objects’ and ‘subjects’, ‘victims’ and ‘saviours’ become blurred, maybe eroded, allowing other interwoven solidarities to emerge. The historic year of 2015, when more than one million people crossed borders into and within Europe, has shown that the gates of the EU cannot ever be fully closed but can, instead, be prised open, through collective and disobedient migration movements and solidarity activism. At the moment, in a time of ‘sovereign backlash’, with reinforced, externalised, and increasingly violent border enforcements at land and sea, in the name of Europe and fear, it is more important than ever to stand in solidarity with migration struggles and rebellious border transgressions. Van Houtum, Henk, ‘Human blacklisting: the global apartheid of the EU's external border regime’, Environment and Planning D: Society and Space, 28 (2010), pp. 957- 976.